Engineered structures have failed for a multitude of reasons. This article will look at some of the notable failures caused by foundations, design, and human miscommunication. The failures are presented in chronological order. At the time of construction, the Quebec City Bridge was to be a wonder of engineering and the longest bridge in the world. Instead the bridge took the lives of 86 workers when the main cantilever collapsed, falling more than 150 feet into the St. Lawrence River. In a cost-cutting move, the bridge’s piers were placed farther out in the river, lengthening the main span from 490 meters to 550 meters. The longer span required high stress that negatively impacted the lower chords on the arms of the cantilever, causing them to bend. This bending and collapse could have been prevented when the bridge’s southern half was taking shape in 1904. During final design, the preliminary calculations which had been made during the planning stages were not property checked, as the actual weight of the bridge was far in excess of the carrying capacity. When the bridge neared completion during the summer of 1907, the onsite engineering team noticed increasing distortions of key structural members already in place. The head of the team, Norman McLure, wrote to the bridge’s consulting engineer Theodore Cooper, who first replied that the problems were minor. It took McLure until late August to convince Cooper that the issue was serious. When Cooper finally telegraphed the bridge’s contractor, Phoenix Bridge Company, alerting them that no more load to the bridge be placed, it was too late. Late that same afternoon, the south arm and part of the bridge’s central section collapsed. The bridge’s collapse was the direct result of errors in design and the miscalculation of loads. The bridge was rebuilt and opened in August 1919. During the construction of the Southwest Land and Lake Tunnel System under Lake Michigan, a temporary dormitory “crib” constructed of wood and brick caught fire. Located roughly 1.5 miles off shore, the crib housed a number of mostly Irish immigrants that were building a brick-lined tunnel under the lake. The workers lived on the crib because it was deemed impractical to carry them back and forth each day due to the large quantity of ice in the lake. At the time of the fire, 95 men were on the structure. Of those workers, 53 perished. Those who lost their lives were either burned to death or drowned when trying to escape. Those that survived took refuge on floating chunks of ice and were eventually rescued by tugs, which had a difficult time getting through the icy water. The origin of the fire is still up for debate, as some historians believe it was caused when a janitor used gasoline to ward off bed bugs. Others think the fire had its origin in a small boiler house about 100 yards from the main crib structure where the tunnel contractor, George W. Jackson Company, stored just enough powder and dynamite for urgent use. Somehow these explosives were put into action and the crib quickly became ablaze essentially trapping the workers. The fire is a cautionary tale to workers and contractors operating in isolated locations that outside help during an emergency may not be available in a timely fashion. Because of the high volume of ice in the water, rescue tugs were prevented from aiding the crib workers in a timely fashion. The second greatest loss of life in California’s history occurred in 1928 when a curved, concrete gravity dam collapsed. 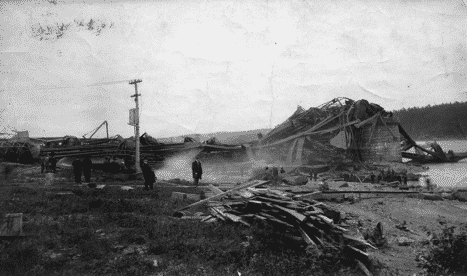 Located roughly 40 miles north of Los Angeles, the storage reservoir failure resulted in more than 450 deaths and is considered one of the worst American civil engineering disasters of the 20th century. Known as the St. Francis Dam, it was part of the Los Angeles Aqueduct. Designed and built between 1924 and 1926 by the Los Angeles Department of Water and Power, the dam had begun to show signs of stress in 1928, with a number of temperature and contraction cracks appearing and a small amount of seeping occurring under the abutments. The department’s chief engineer, William Mulholland, checked the leaks less than a day before the collapse, deeming the cracks to be of average level for a dam of its size. Twelve hours later only a middle portion of the dam remained. Defective foundations, not the dam design, were to blame for the collapse. Reports found the west end of the dam was founded upon a reddish conglomerate that even when dry was of inferior strength. When wet, the conglomerate became so soft that it nearly lost all rock characteristics, undermining the west end. The failure of the west end released a rush of water that caused a heavy scour against the eastern canyon wall. This scour led to the ultimate collapse of the dam. More recent findings have shown the dam was built on an ancient landslide, which would have been undetectable to engineers in the 1920s. Reports suggested the utilization of inspection galleries, pressure grouting, drainage wells and deep cut-off walls could have postponed the final failure; but also, acknowledged that due to the defective foundation it was unlikely any of these devices would have been effective. Dubbed ‘Galloping Gertie,’ the Tacoma Narrows Bridge opened in July 1940. Four months later, the suspension bridge main span collapsed amid high wind conditions, the result of aeroelastic flutter. No human lives were lost. One dog in a car died. The solid sides of the bridge restricted wind from passing through the deck. Instead the bridge caught the wind, which reached 42 mph on the day of the collapse, causing the deck to sway and bend from side to side. This violent bending caused the deck to break, falling into Puget Sound. Dismantling of the remaining towers and side spans that survived the collapse of the main span continued until May 1943. The collapse remains a prime example of aeroelastic flutter and the impact it can have on a structure. The Tacoma experience taught engineers that wind causes not only static loads on the bridge, but also significant dynamic actions. The bridge was rebuilt and opened in 1950. Nearly 60 years later, a twin suspension bridge was built next to it and carries the eastbound Highway 16 traffic. The 1950 span carries the westbound traffic. Completed along the Ru River in 1952 with the help of Soviet consultants, Banqiao Dam stood 24.5 meters high, comprised of clay and featured a maximum reservoir discharge of 1,742 cubic meters per second. Soon after completion, cracks in the dam and sluice gates appeared. These cracks were repaired, with the new design dubbed the iron dam. The iron dam failed 23 years later. The failure of Banqiao Dam and the subsequent collapse of 61 other dams in China’s Henan Province are responsible for claiming the most casualties, an estimated 171,000. The flooding that resulted from the mass dam failures wiped out entire towns, displacing an estimated 11 million people. Failure of the dam’s sluice gates followed a period of record rainfall that occurred when Typhoon Nina ran into cooler northern air. Storms dropped a meter (3 feet 3.37 inches) of water in three days. The dam was designed to handle a maximum of roughly 0.5 meters over a three-day period. Immediately following the three-day storm, water in the reservoir crested 0.3 meters higher than the dam’s wave protection wall. The sluice gates were unable to handle the overflow of water and failed. Sedimentation blockage contributed to the gate failures. In the six hours after the failure, an estimated 701 million cubic meters of water was released from the reservoir. Upriver at Shimantan Dam, 1.67 billion cubic meters of water was released in a 5.5-hour window. Several other dams were deliberately destroyed by air strikes, with water released into flood diversion areas. In total, 15.738 billion cubic meters of water was released. Officially, blame for Banqiao Dam’s was placed on nature. However, there were problems with the dam’s safety features. Renowned Chinese hydrologist Chen Xing, who was involved in the design of the dam, recommended the dam feature 12 sluice gates. Instead, the dam was built with only five. The Banqiao Dam was rebuilt and completed in 1992, standing two times taller (50.5 meters) than its predecessor. The reservoir now features a catchment area of 768 square kilometers and a maximum reserve capacity of 675 million cubic meters, which is 34 percent larger than that of the failed dam. The maximum discharge of the reservoir is 15,000 cubic meters, with effective storage at 256 million cubic meters. The normal high water level for the reservoir is 111.5 meters above sea level, with the crest level at 120 meters. Following the failure, the Chinese government put a larger focus on the surveillance, repair and consolidation of reservoir dams. Most of the country’s dams were constructed between the 1950s and 1970s using low construction standards. In the last 20 years, the government has invested more than $10 billion toward the repair and consolidation of these degraded reservoirs. 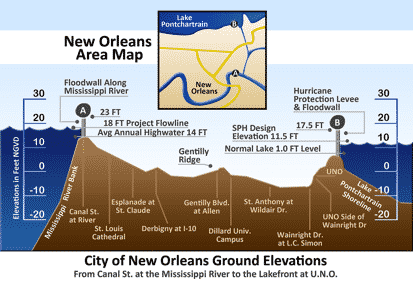 In late August 2005, more than 50 levees and flood walls protecting New Orleans and suburbs failed following passage of Hurricane Katrina which made landfall in Mississippi. 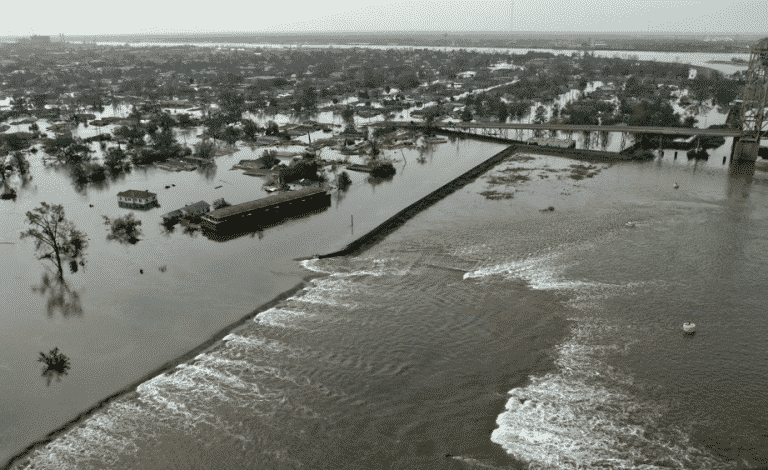 The failures caused flooding in 80 percent of New Orleans (Orleans Parish), all of St. Bernard Parish (southern edge of New Orleans region), and took the lives of nearly 1,900 people. Additionally, more than 100,000 homes and businesses were flooded, causing billions of dollars in property damage. Shortly after the mass levee failure, blame based on misinformation was placed on a number of culprits. It wasn’t until ten years later that a team of experts defined the elements that led to the failure in an article published in Water Policy, a peer-reviewed journal. The lead author was J. David Rogers, a professor at Missouri University of Science and Technology. The article placed the main fault on the U.S. Army Corps of Engineers’ misinterpretation of a full-scale load test it carried out several years prior in the Atchafalaya Basin, which is located in south central Louisiana. After these tests, it was determined that flood walls within the city, built in the 1990s and early 2000s, should be installed at a depth of 17 feet, instead of the initially-suggested depths of 31 feet to 46 feet. This decision was made with the city’s budget in mind. Misinterpretation of the test results occurred because a heavy cloth tarp covered the gap that formed between the sheet pile supports and the ground during testing. The tarp was present as a safety measure and the impacts of the tarp were not accounted for during the tests. In short, engineering oversights occurred. These oversights may have been prevented if the Corps had utilized an external peer review board to double-check test findings and the design of the new flood walls. During construction of the Boston (MA) Big Dig mega project, a portion of Interstate 93 was re-routed through a 3.5-mile tunnel. A section of the suspended concrete ceiling in that tunnel detached and fell onto a vehicle driving through the tunnel. The panels crushed the right side of the vehicle roof, killing the passenger and injuring the driver. In total, roughly 26 short tons of concrete and suspension-related hardware fell onto the vehicle and roadway. The ceiling panel measured 20′ µ 40′. The National Transportation Safety Board cited inappropriate use of an epoxy anchor adhesive as the cause of the panel detachment. Over matter of weeks, the epoxy deformed and fractured, which led to several ceiling support anchors pulling free and the panel collapsing. The epoxy utilized in the tunnel was also found to have poor creep resistance that allowed it to deform. Fast-set epoxy, the type used, is not for long-term (more than 80 days) use. Standard-set epoxy was specified. A nearly-completed, 13-story apartment building in Shanghai, China tipped over sideways after the precast concrete piles snapped. One person died. The complex was built next to a river. During excavation of the building subgrade parking garage, construction workers dumped soil adjacent to the building’s north side, the side opposite the river. During a heavy rain, the 33-foottall soil pile became dense and fluid with water. The saturated soil mound created a large pressure on the building’s north side. At the same time, the garage excavation had reduced soil pressure on the south side of the building. The differentiation caused a net soil pressure flow toward the un-built garage, which reduced stability in the deep foundation and left the piles unbraced and primed to snap. The collapse brings attention to how inadequate site planning and sequencing can comprise the strength of a building’s foundation and piles. Additionally the project developer’s construction license was found to have expired five years prior. In 2013, an eight-story commercial building collapsed in Dhaka, Bangladesh, killing 1,130. The incident represents the deadliest accidental, structural failure in modern history. An additional 2,500 people were injured and rescued from the building, which housed a number of garment factories. The failure, which brought down the entire reinforced concrete building, occurred a day after cracks appeared in the structure. The failure blame main culprits were a disregard for building codes and corrupt business and administrative practices. Reports found the land underneath the building to be unsuitable for multi-story construction and led to differential settlement. The site previously was a marshy swamp with a small pond. The soil composition was unstable and could not support the weight of the building. Rather than removing and replacing this soil, trash was used to fill in the swamp. The building owner, Sohel Rana, bribed officials to grant him the permits necessary for construction. He also bribed engineers and the local mayor to sign off on the project. During construction, extremely poor quality iron rods and cement were utilized. The cement used for concrete included too much sand, making it weak; while the amount of steel embedded in the concrete was reduced to save money. Originally designed and permitted as a four-story building for retail use, the structure became an eight-story building that housed garment factories on the upper six floors. These six floors of factories housed heavy sewing equipment, hundreds of employees, and a large inventory of garments and fabrics, all of which contributed to the overload of the structure. A ninth floor was under construction at the time of collapse. A day prior to the disaster, the shops and bank that occupied the two lower floors closed after cracks in the building were discovered. The building factory owners ignored warnings to avoid future use of the structure and deemed the building safe and ordered workers to return the following day, the day the building collapsed. This winter, during a period of gusty winds, a crawler crane in Manhattan (New York City) was being lowered into secure position when the 565-foot-long, nearly 600-foot tall crane came crashing down on the street below. Construction workers had closed off the street which kept pedestrians and traffic away when the crane was being lowered. The single life lost was a man sitting in his car. Two people were injured. Blame for the crane collapse was placed solely on operator error, as standard procedures for raising or lowering a jib and boom were not followed. As the crane latticed boom was lowered, the headache ball still hung off the jib. Additionally, the main boom closest to the cab was lowered before the luffing jib was firmly on the ground or in a vertical position. These two mistakes, combined with winds, made the boom and jib lean and sway, eventually creating enough force to flip the crane cab and bring the boom and jib down. A day prior to the crash, city building inspectors gave approval for the crane operator to add an extension on the upper boom. The work was found to be in full compliance. Following the crash, the city mandated that more than 400 active crawler and tower cranes throughout the city be secured until an investigation into the crash was conducted. 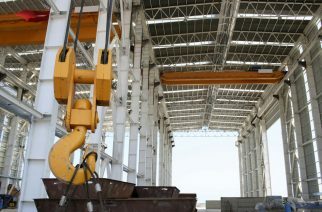 The accident stresses the importance of following standard procedures when lowering a crane into secure position and the avoidance of rushing a task. Proper planning is also brought to attention when discussing this incident, as the contractor responsible for operating the crane should have known days before the accident that heavy winter winds were expected that day.